"Nothing came at all, I just got stuck on these two chords and a phrase ..."
I was a huge New York Mets fan growing up. Not so much nowadays - I didn't watch any of the recent games when they came within a game of the World Series - but as a kid I was nuts about 'em. The 1969 World Series was one of the great highlights of my kid-dom. 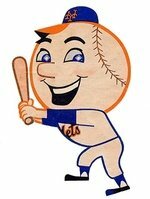 So I shouldn't have been surprised when I remembered all the words to the "Meet the Mets" theme that started out all their radio broadcasts back then. For all I know, it still does. Haven't been out there to listen for a while. I don't know why I decided to share the beer sounds with you. It was an impulse. It adds to the show's atmosphere, though, don't ya think? While on the subject of my childhood, I also loved comic books, which is how the Batman records got into my attic. The songs were somewhat disappointing, as you'll no doubt hear, but the packaging was pretty nifty and well worth the 49 cents each (I think this was before the New Jersey sales tax was invented, too! so it wasn't 52 or 53 cents, it was what the label said: 49 cents.) 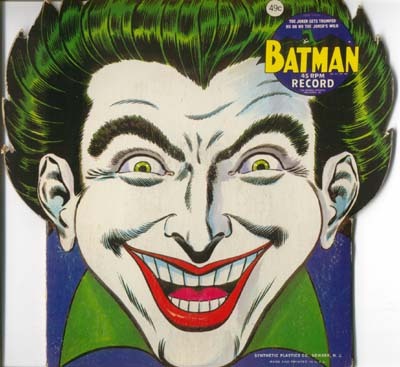 It was tough picking out which song to inflict on you, but "The Joker Gets Trumped" won out. Reminiscing about my childhood morphs into discussion of caramels, with a hearty recommendation from your humble host. This week's foray into the mid 20th century brings us Nat Gonella and his New Georgians with an infectious tune called "I'se a Muggin'" - I figured you might need another infectious tune to get "The Joker Gets Trumped" out of your head. Gonella's has the advantage of being a tasty jazz recording. After a brief interlude, we move into the tale of how "Wanting to Live Forever" was composed. "WTLF" is the true story of a morning in January 1986 when I sat down with my guitar with a goal to write a new song, got stuck on two chords, and found myself wondering what the point was. As I wrote, I ended up with some words of encouragement for anyone who ever wonders why they're following whatever dream they're pursuing. Once again Kirsten contributes a valuable piece of the podcast - thanks! - when I mentioned the other day I wasn't sure which version of "Wanting to Live Forever" I was going to play - the 1986 recording, which I made about four months after writing it, or the new version I'm just polishing now, she wrote, "I'd like to hear both." Why not? It means postponing a bit from the National Lampoon Radio Hour for a couple of weeks, but it was fun to spend time talking about the creative process and sharing the evolution of a song I'm kind of proud of. I hope you like it. Next week should be a fun one - y'all come back now, here?